He said the thing! The thing from the movies! We’ve been working on the comic since 2011. This was, in no way, a constant, productive workflow (it turns out there’s a lot of cool stuff on television and video games are super fun!). This February we decided enough was enough, and finally set a launch date–April 1st–expecting to launch with three pages and have another four in reserve. As you may have noticed, we didn’t. Instead, we launched with two pages, and had none in reserve. This means that every week is a race to complete the page before Tuesday morning. And it’s a race we’ve been losing lately. There’s just no breathing room, and any unexpected issues that crop up mean the comic won’t get posted on time. It’s frustrating, it’s stressful, and it’s not fair to you guys. Something’s gotta change. That’s page 13 up there, and it’s a good place to pause for a little bit. We’re gonna take a few weeks off while we build up a bit of a much-needed buffer on the comic, and finally fulfill some delayed Patreon rewards for April and May backers. The comic will return on August 5th, and barring any unexpected (or expected) dismemberments on Ben’s part, should proceed without further interruptions. Hell, even if he loses lefty, we should be able to keep to the schedule. So the comic’s on pause til August 5th, but we’re not going dark. 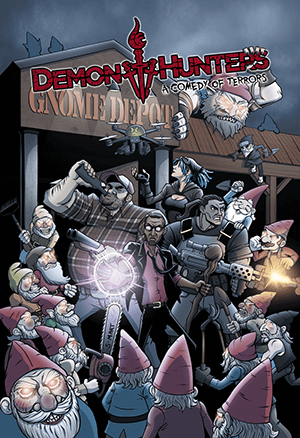 Tuesday is still Demon Hunters day, and I’ll be filling in with a series of short stories set in the DH universe. I’m not sure exactly what I’m gonna do yet. I don’t have anything in particular planned, but I’m eagerly taking requests! Any particular characters you’d like to hear more about? Locations? Events? Sound off in the comments! I love a challenge! Also, don’t forget that Kentucky Blue Clay will be back on July 3rd for his regularly scheduled Storytime with KBC. Be sure to take a break from freaking out my poor, nervewracked dog with your damn, noisy fireworks to check that out! Demon Hunters returns on August 5th. We’re crazy sorry for the rain delay, folks! We promise, the comic will be SOOOOOO much better as a result! EDIT: Ben decided to be an adult and bought a friggin’ house! That’s great for him and his family, but not so great for productivity. As a result, the hiatus is being extended a bit so Ben can dig all his drawing stuff out of their boxes and get it set up in his new home. Demon Hunters will now return on August 5th, not July 15th as previously stated. The post above has been edited to reflect this. Gabriel, with his face freshly cleaned, closes the van's door. GABRIEL: Alpha One's out of the question. I get that. But there's a ton of other Chapters out there that we can join up with! Or hell, we can just start a new one! Not to brag, but let's face it, any team with you and me on it is gonna be the best in the Brotherhood. Gabriel stops, turning toward Jim. He's had a frustrating realization. GABRIEL: Aw crap, Jim! Now that you're not dead, you'll still be assigned to Alpha One! Closeup on Jim. There's the slightest hint of a smile. Flashforward to Alpha One's HQ. Jim holds a long-haired white cat by the scruff of its neck; legs dangling. It's soaking wet, and not loving the experience. It has surrendered to this situation and looks miserable. SILENT JIM: Ichabod. I bleached your cat. Gabriel leans against the camper van, smiling and staring into the middle distance. Jim stands next to him, arms crossed. He lives in the middle distance. Gabriel reaches into his jacket's inner pocket. GABRIEL: What the hell, right? It's worth a shot! It's not like they can fire me twice! Let's do this! Get in the van, Jim! Closeup on Gabriel as he puts on his sunglasses. There's that cocky, confident smile we were all missing! A story about the Purple Ninja would be cool. I’d also like one about KBC- that is, a story about him, not told by him. And if you want to write something villain-y, and it’s not too early to unveil him, it would be awesome to see some Sam Hell. The cat bit was killer! I applaud you for your decision. I think it’s definetely the right one. As for short story requests: Don mentioned on facebook that the Lovecraftian universe (or at least its “monsters”) are canon in the Demon Hunter universe. I would like to learn a little more about that. 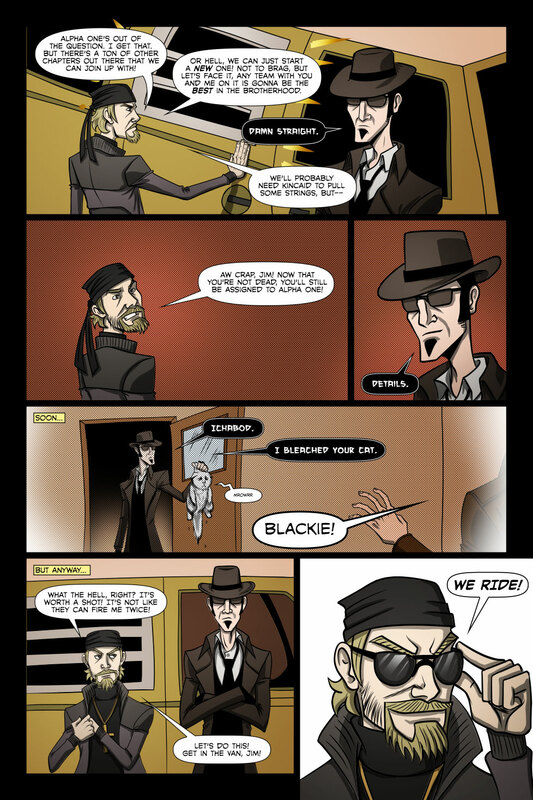 I have been waiting for the famous “we ride” scene that I have always loved since the beginning and here it is! I just noticed, are you guys leaving the duct tape off the back of Gabriel’s jacket on purpose? Isn’t it necessary? Good eye! It started as a mistake, but it’s become intentional. It’ll show up eventually (even the DUCT TAPE has an origin story!). As for being necessary, nope. New universe, new rules. This Silent Jim seems to be shaping up as a much more “lively” character. Gabriel is getting his groove back (that doesn’t sound right). Aaaaand there’s a whole new game that you guys have been working on. Glad to hear it! When Matt Vancil first pitched the project to me, I was worried that the movie’s small but fiercely loyal cult following would want my head for some of the changes we were planning. But so far, everyone’s been really receptive and eager to see what’s new in this universe. If you have to take a break this is a line to take it on. This has been our most lively page so far and I haven’t even chimed in yet. Anyway, thanks everyone for sticking with us this long. I’ll be posting a blog entry here in a day or two where I’ll talk about the comic from my perspective and what I intend to do to make it a great experience going forward.